Question: How fast do the trains go? Faster than the cars do during rush hour, at least. The trains have a governor built in that brings the train to a smooth yet irretrievable stop if it goes above about 58mph (though some of the Type 1s are more like 60mph). This is called an overspeed and (thankfully) is not a rule violation since a lot of new operators overspeed by accident their first time going down a hill. Speedometer of one of the low-floors, I think this was a Type 3. Sorry for the reflection of my safety vest! 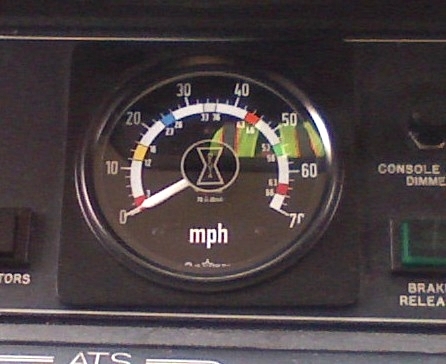 The type 1s, 2s, and 3s have three “speed maintain” or SM modes to prevent overspeeding when going down a hill – SM 1 prevents a train from going faster than 55mph on a hill, SM 2 prevents a train from going faster than 35mph, and SM 3 tops off at 15 mph. There aren’t overspeeds associated with the SM modes, they just sort of work like cruise control when going downhill that they’ll hold a train at that particular speed and prevent it from going over. The type 4s are a little different – those can be set to any speed and maintain it whether going up or down a hill, which is part of the reason the ride quality of the 4s is so smooth. Many stretches in ABS territory have a speed limit of 55mph, which can be done since ABS territory is dedicated rail so there isn’t a worry about running with vehicle traffic. In areas where there are curves, gated intersections, platforms, etc, the speed limit will be lower. 35mph is the maximum speed limit in pre-empt territory, found along most of Burnside. 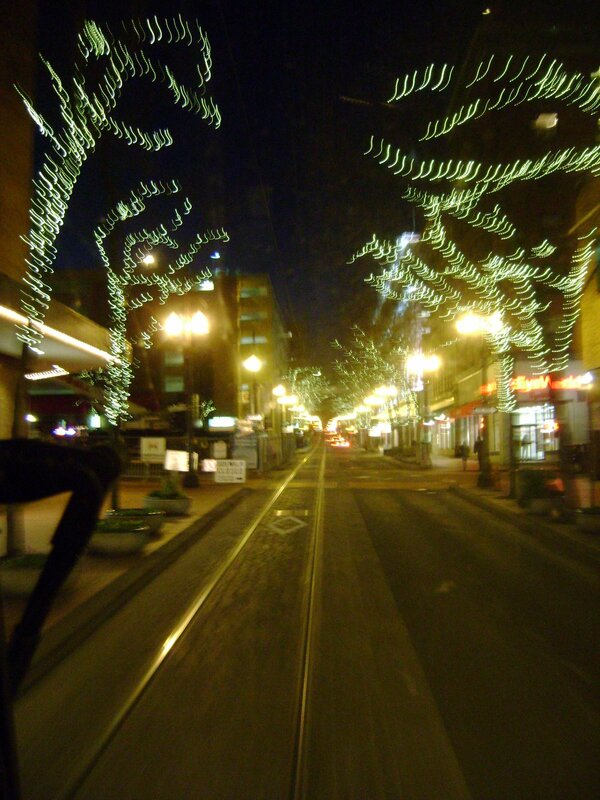 All of my Burnside pictures are too dark to be worth posting so I had to borrow this one. 30mph is the maximum speed limit along Interstate. The Yellow Line doesn’t pick up any appreciable speed until the Vanport Bridge, which is the only area of the Yellow Line alignment that is ABS territory. Along Holladay in Portland and Washington St in Hillsboro (both pre-empt territory), the speed limit is 25mph. 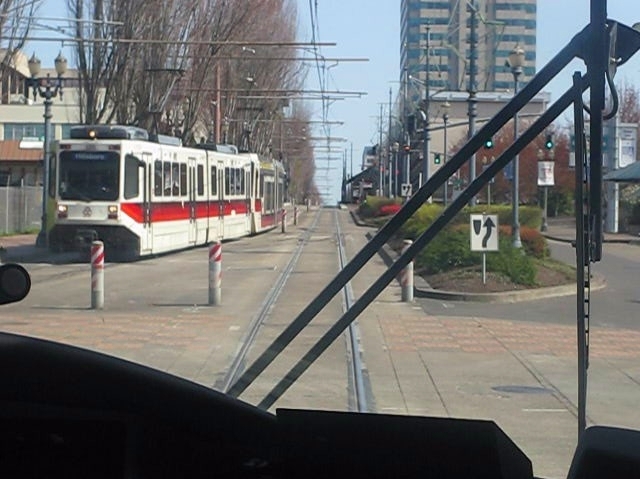 In the CBD (both the original Blue & Red line east/west alignment as well as the north/south Portland Mall alignment) the speed limit is 15mph on the straight sections of track. Around some of the curves in this part of the alignment (Goose Hollow, PGE Park, Skidmore Fountain, 1st Ave, and that area up by Union Station), the speed limit will be 8mph or 10mph. Remember when cars used to drive across the middle section of the bridge? 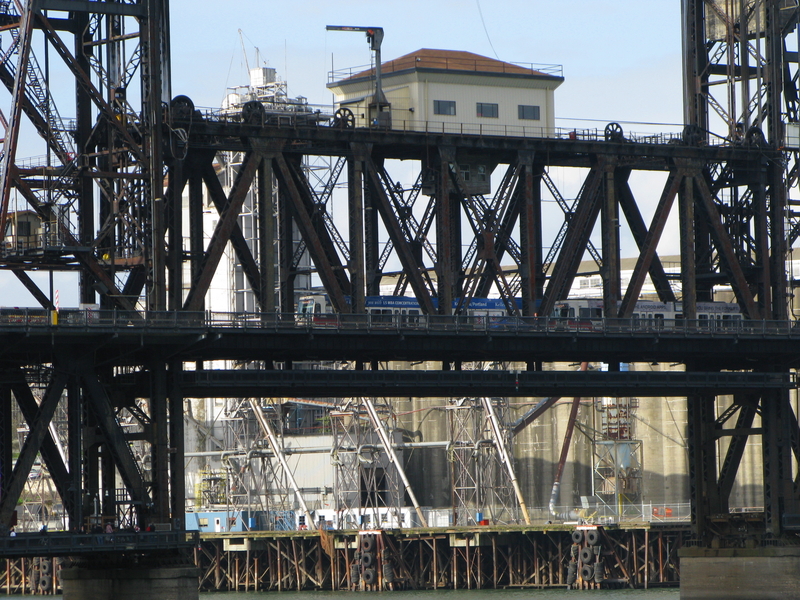 The Steel Bridge span – not the entire bridge, just the part that can be raised. Even at that low speed you can feel a pretty large bump going over the bridge joints – the speed limit isn’t that low to protect the structural integrity of the bridge, but rather the vibrations created by going faster can damage the microswitches on the machinery on the bridge. Getting up to the span and once the entire train is off, the speed limit is 15mph, same as the rest of the CBD. The “fishhook” – that curve after Gateway that is used to diverge to the airport alignment is also 10 mph. 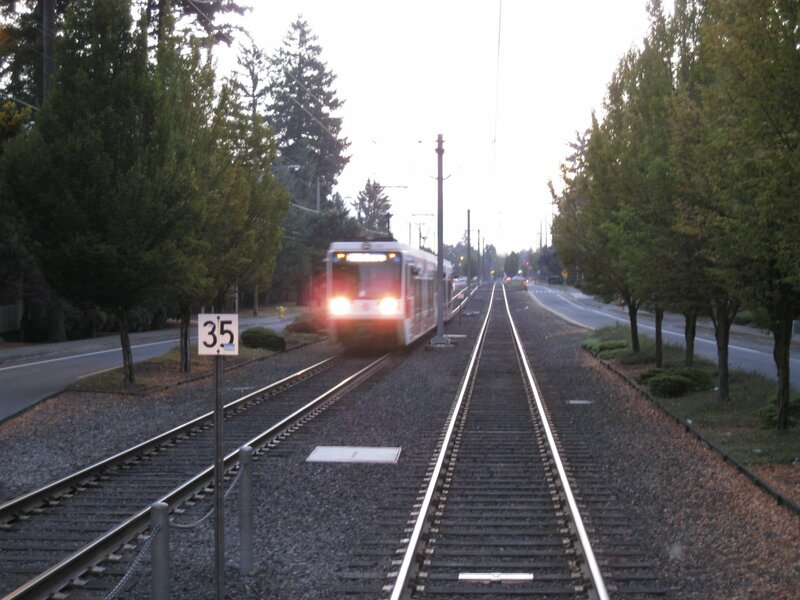 Over some switches, the speed is 5mph – you’ll see this entering or exiting Hatfield in Hillsboro, and also heading west into Rose Quarter. 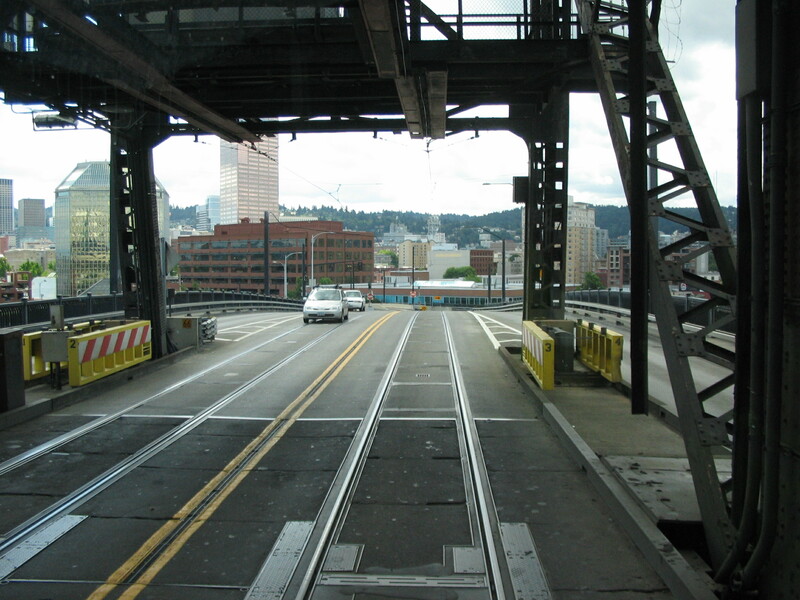 When the Yellow Line used to turn around at 11th Ave, the speed over those switches was also 5mph, as are the switches into and out of the Jackson turnaround by PSU. The speed limit into platforms is 20mph or the posted speed, whichever is less. The front of the train must be at that speed by the time it reaches the near end of the platform. There are some platforms where the approach speed is slower (e.g. Rose Quarter westbound as previously mentioned because of the switches, Millikan Way westbound because of poor visibility, Gateway and Beaverton Transit Center because they’re so busy, etc) but most are 20mph. 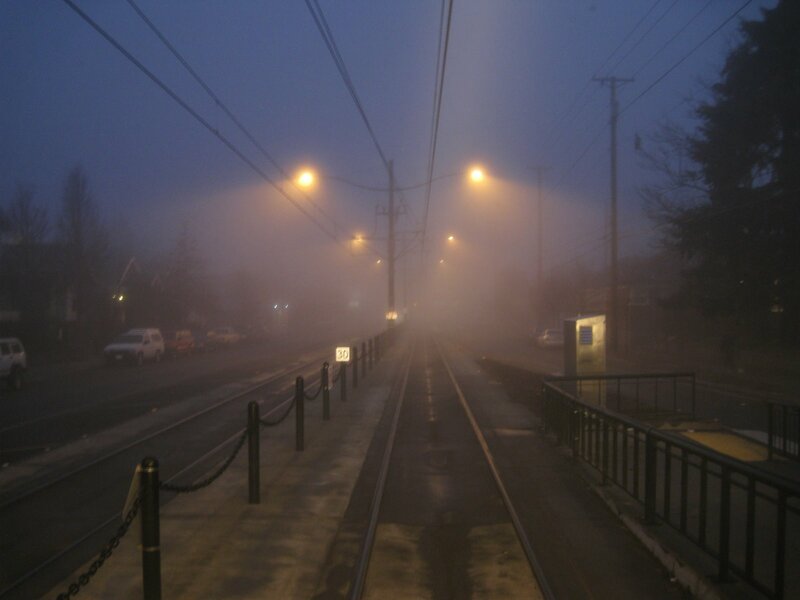 An out-of-service train bypassing a platform will also slow to 20mph until it’s clear of the platform. 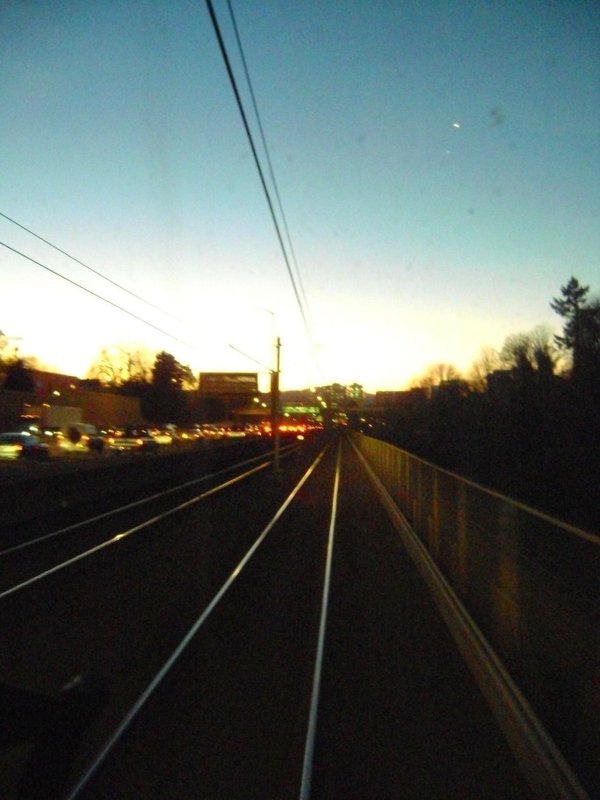 This entry was posted in safety, speed, train cars, video and tagged light rail, max train, portland, public transit, public transportation, rail, railroad, safety, speed, speed limits, steel bridge, trains, trimet. Bookmark the permalink. There are also what appear to be photo radar “Your Speed” signs at certain spots in the alignment (ex: entering certain stations on the green line). 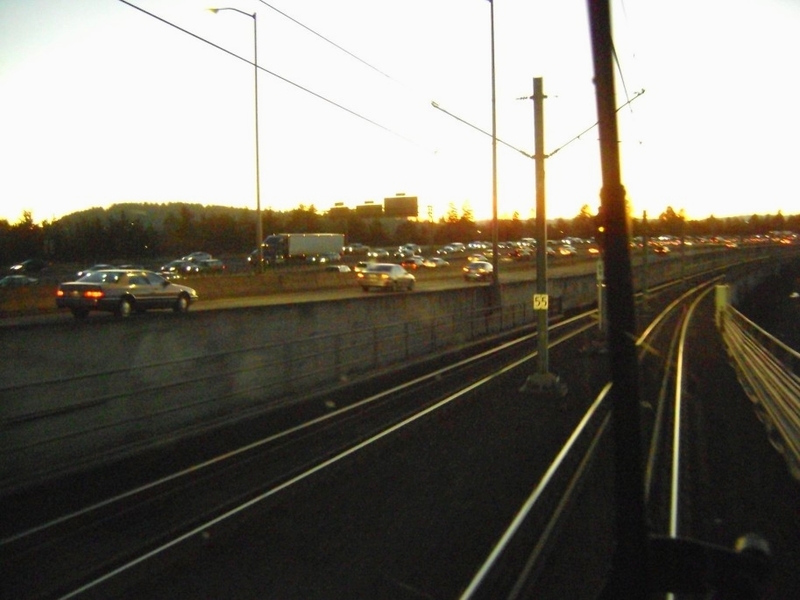 Yep – there’s also one of those westbound into Hawthorn Farm on the Blue Line, and southbound into Kenton/Denver off the Vanport Bridge on the Yellow Line. As far as I know those are speed tripped, but I’m actually not sure if the speed on those is calculated the same way they are for cars like photo radar, or the same way the speed trips elsewhere are calculated/activated once the train passes over a pickup. As I understand it, the signs are supposed to just be a helpful reminder to operators and are not tied to the calculation of your speed for the purposes of ATS. I remember the trainers telling our class not to rely on them as an accurate indicator of speed as some operators have gotten speed trips by doing so.